Duration: 13 Nights / 14 Days Tour. We receive you at the Colombo Airport. We will provide a local number SIM with Rs 700 call time and 500Mb data. Bring your unlocked phone standard SIM or Nano SIM further reload should be done by you. By vehicle we travel to Negombo beach accommodation. Meet the tour leader, group members, mechanic and the backup driver. Enjoy the beach and the town or rest. 20 minute drive from Airport to Negombo. We start the day riding towards Dambulla. Wide open road with scenic view. Countryside adventure occasional stopping for coconut water drinks. We arrive at the Dambulla Cave Temple in the afternoon: This is one of the UNESCO sites in Sri Lanka. The site is estimated to be from the 1st century with 80 caves and more than 150 Buddha statues. Energy filled riding from the morning towards Sigiriya, Lion's Rock. Let's park the bikes and climb atop 370m starting at the Lion's paws for to view the water garden and the amazing view of the surrounded landscape. This 5th century, site provides ancient paintings and beautiful gardens with reservoirs. The we take our bikes and ride towards Polonnaruwa which stands with religious and garden remains of the 800 year old capital. We expected to be here by lunch time and then in the evening can go around the place and capture videos and images. We are going to higher ground from the flat land. Each and every turn will provide exciting view of the land that you will remember for your life. We will enter the Knuckles Mountain Range that is with bends after bends and hairpin turns that will make you to feel going in to a cool land with green views. If like, can stop by the beautiful waterfalls to take photographs. Today we are going to run through the tea plantations and smaller roads that pass travelling via rainforest. Dumbanagala where we stop to see views of the Dotulugala Range and water falls. Surrounding thick forest will give you breathtaking views all over the touring route. 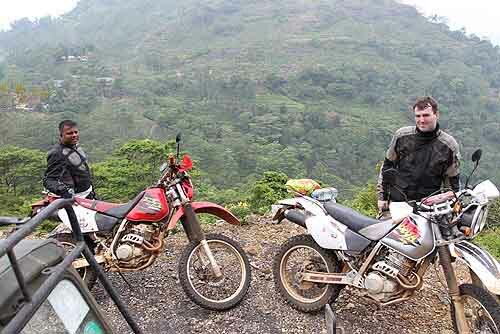 There is chance to ride off-road for a distance of nearly 25 Km distance. We start the day back to Kandy with our motorbikes. we can visit mini world's end.Let's visit the Dothalugala falls in the day time and go for to watch the traditional devil dance in the evening. Start the day little early towards the little England - Nuwera Eliya - passing by the beautiful Ramboda waterfall which is said to be 109 heights and with two head falls. Then we travel through tea plantations narrow winding roads that are slowly climbing up. on the way we stop by a tea factory to smell the taste of the newly roasted black tea. You can watch here how the tea is produced from the young green leaves in to black tea. We reach Nuwera Eliya to feel the cool atmosphere. Time to visit the world's end located in the Horton Plain National Park. You will ride again the green land filled with valleys, waterfalls and streams. Oh we need to mention people may like to photographs with you which they will never see but will be happy that they had been captured by a visiting foreigner. if we can be on a clear day at the worlds end then there is a big chance to view green mountains and valleys filled with streams from faraway lands. Then we ride down hill towards the plain terrain land where you will feel little hot temperature as we had left the cool mountain region. 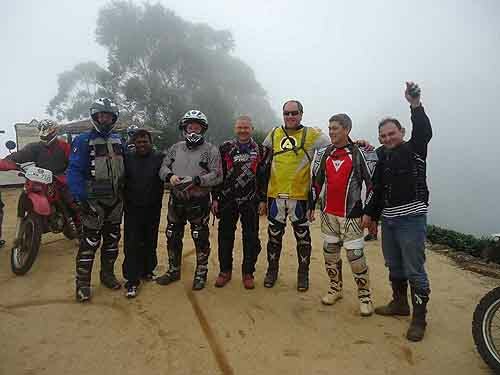 It is time to forgot your bike get in to the 4 X 4 jeeps to watch wild elephants leopards sloth bear wild boars and deers. Water buffalos are always there to welcome you but other wild animals you have to wait for them. If the sky is little dark then you have the chance to view the beautiful peacock doing the mating dance with its long beautiful feathers. Then we jump out of the Jeeps and take our motorbikes to ride towards Mirissa beach. The beach is popular after the Negombo beach but this beach offer many water sports activities. 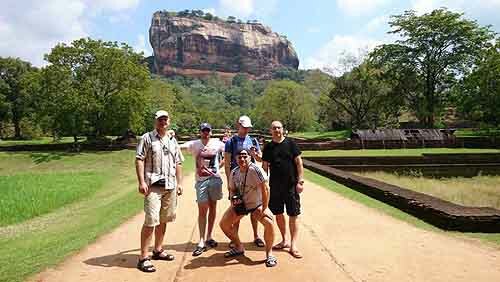 We can visit the Galle city which is popular for its Dutch fort and mentioned by travelers for its tasty international cuisine and for shopping. Then we ride back to our hotel in Mirissa for rest. Heard about how they make natural rubber? Today you can watch how they collect latex by cutting the rubber trees. We will ride through rubber plantations where there are tall trees on both sides of the roads. When we reach the Kitulgala we can go on white water rafting in the Kelayania river which the locals call as Kelani Ganga. It is best part of the tour and we rest in the cool place for tyhe night. We are going to spend the evening and the night in the Negombo beach side. We will travel again by the rice fields, if it is in the early stage it will be green all over the land otherwise you can see a land of yellow color with cut paddy husks all over the place. 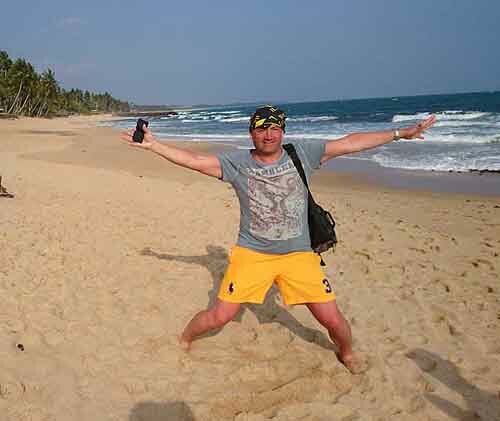 In the beach you can relax once you reach Negombo or go on shopping to take home some souvenirs. Time to say good bye to your team leader and your team members. We will take you back to the Colombo airport to catch your next flight. Come back ride with us in the coming year too. Meals at selected resturants with western dishes or local dishes. Mineral water, Delicious Local Dessert and Tasty Tropical fruits can be arranged on the route. Adjustments can be made according to the tourist wishes.